Peach State Roofing, Inc. was established and incorporated in the state of Georgia in 1990. 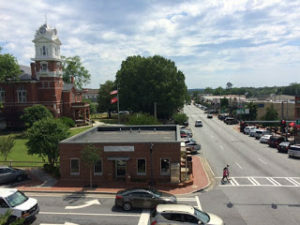 Headquarters were eventually established in Lawrenceville, Georgia and the company still has its corporate roots at that location. Combining vast field experience with strict project management skills, Peach State Roofing has rapidly emerged as a preferred leader of commercial and industrial roofing systems nationwide. With 15 office’s serving coast-to-coast, Peach State Roofing is widely recognized as one of the largest applicators of singly ply, modified bitumen, and metal roofing systems withing the United States. Our philosophy, financial stability, and business ethic, provides the necessary tools for high quality service to the construction industry, building owners, and beyond. Our success is measured by our financial stability with a high Dunn and Brandstreet rating and our ability to secure unlimited bonding for our projects. We are approved contractors for manufacturer’s such as Johns Manville, Carlisle, Firestone, Fibertite, GAF, Versico, GenFlex, and Sarnafil. Our values are quite simple, “We Work”, “We Respond”, and “We Take Action”. Our attitude and philosophy is to take whatever action is necessary to simply “Get The Job Done” on time and in budget.